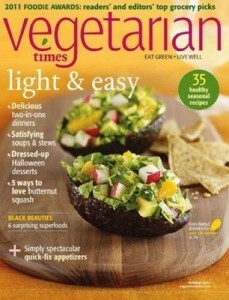 Vegetarian Times Magazine Subscription, $4.44 with Coupon Code: VEGGIES Yes that is $4.44 with FREE SHIPPING! Get a whole year of Vegetarian Times for this very low price. This is such a great deal on this magazine that I just ordered one myself. I have been a vegetarian for most of my life and have 2 vegetarian and 1 vegan child – so this is going to be a great choice for my family! Subscribe to Parents Magazine, just $3.50/year (64% off) from DiscountMags.com! I got a few years worth when I found a deal for $3 something each once. Then I forgot I did that and thought my subscription was running out, so I signed up again. Now I get two issues a month! I give one to my sister, but I don’t know when one is going to run out, so this will be a great deal for her. We’ve been vegetarians (sometimes vegan) all our lives! Thanks! This was due to expire this evening but it looks like it may have expired already. You have to be so fast sometimes with these deals! Sorry you missed it.